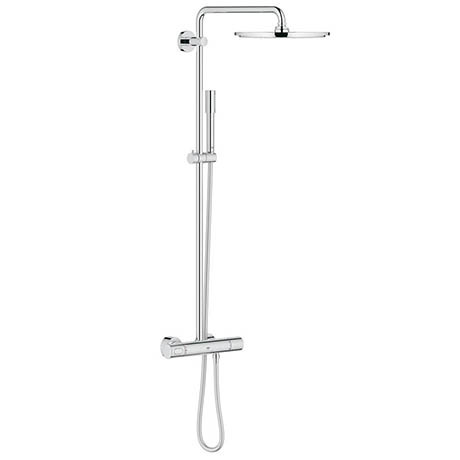 The Rainshower 310 Thermostatic Shower System is the perfect choice for the modern bathroom. It boasts a large round 310mm head shower that can swivel to create the perfect angle while the shower handset is height-adjustable and attached to a 1750mm Silverflex twist-free hose. The easy-to-use GROHE SafeStop feature limits the water temperature to a maximum of 38˚C while GROHE TurboStat® technology means you can take a luxurious shower secure in the knowledge the water will stay at the pre-selected temperature even if the water pressure changes.